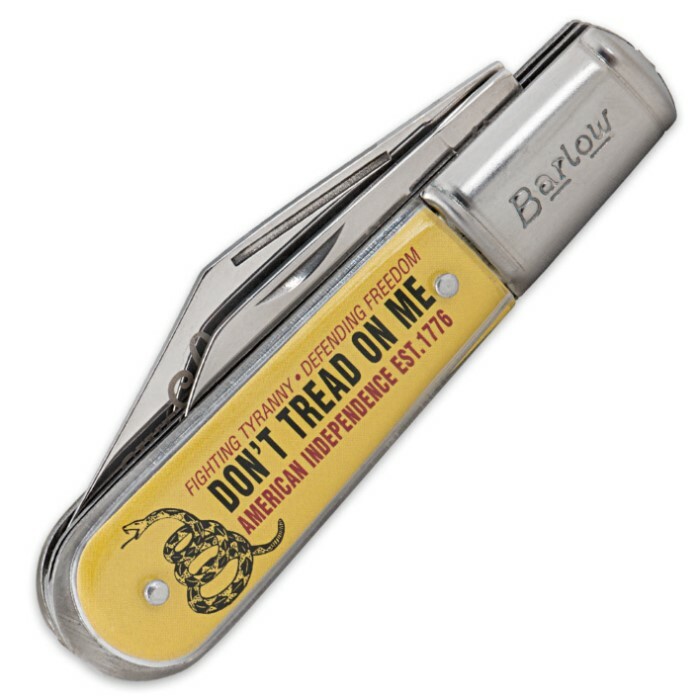 "Don’t Tread On Me" Barlow Pocket Knife | BUDK.com - Knives & Swords At The Lowest Prices! 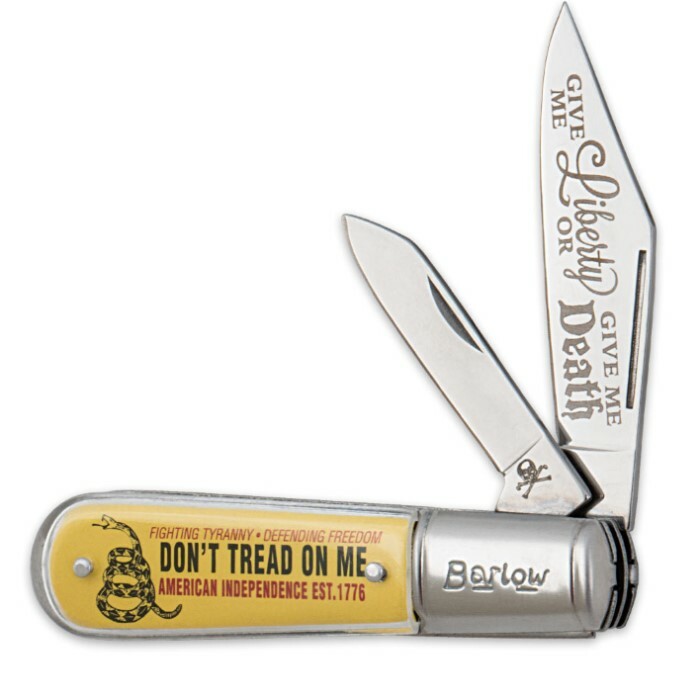 The "Don't Tread On Me" Barlow Knife has a great old fashioned look to it that gives it the appearance of a family heirloom. It features "Give me liberty or give me death" etched on the larger blade. Both blades are made of 3Cr13 stainless steel and have a satin finish. 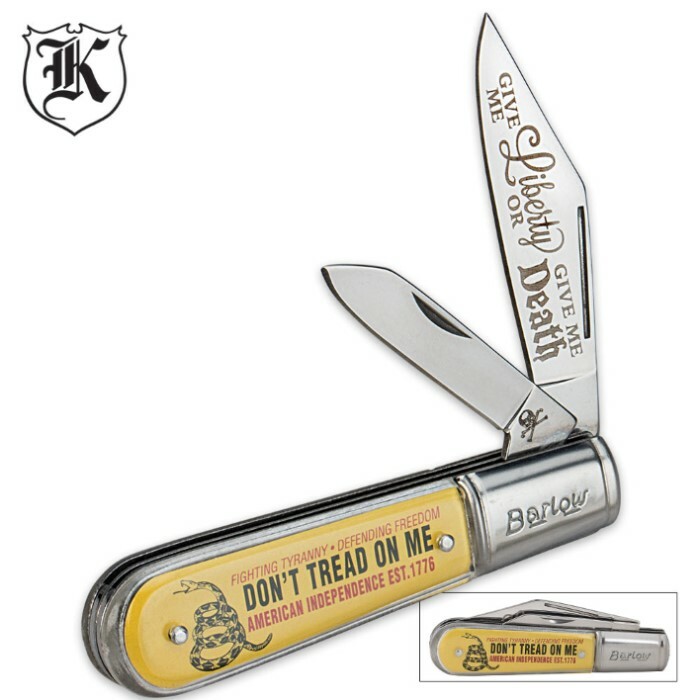 It has a plastic handle with a "Don't Tread On Me" themed underlay. Own a little reminder of what this country was built on! This is a standard pocket knife, looks good and feels good in hand, honestly nothing special but for only 2.98 its a steal! Both blades came very sharp and my son absolutely loves it! He was ecstatic when he saw it! Good quality product for an absolutely fantastic price! Over all a great knife, better then I expected! Sharp and cool looking! I ordered this along with some other products. It is a nice looking pocket knife. Well constructed and both blades came reasonably sharp. The printing on the blades and underlay are sharp and well done. All in all, a good little knife.